Simple steps to photograph the Milky Way and get results that you will be proud of.. Some of the essentials such as a camera and others that are more optional. The Milky Way does not care what camera you have so brand is not important and neither is it important to be full frame such as the Nikon D610, Canon 5D or crop sensor such as the Nikon 3200 or Canon 1200D. Factors which will allow you to take pictures of the milky way are that the camera you use needs the “B” (Bulb) setting for use with the shutter release (see item 3) and variable ISO settings in the menu or on a button. This is probably the most important item to have although some will argue that they have taken shots without one but for anyone starting out a good solid tripod is essential. The Milky Way. You have seen the stunning shots and don’t know how or you have tried to photograph it and failed, as I have many times. We can run through the basics here and when you have tried and had some good results maybe you will spend some time and take it further. We all know that to take a picture we need to expose the sensor in the camera to light and it’s no different when we want to take a picture of the Milky Way, just a little different to what your used too with a few extra problems. The first problem we encounter when we get out to take pictures of the Milky Way, or any star type picture is that its dark but that’s good and darker the better. Light from towns and villages or even the moon create “Light Pollution” which create a glow on any image we take or render it impossible to see If you can escape to the country side all the better but there are many pictures where the pollution has enhanced the image so it’s no excuse not to try. Another killer for any “astro” photograph is cloud, so you have two options; being ready to go take the picture at very short notice when conditions are right or option two planning the trip looking at weather / cloud forecasts and hope they are right. Our planet has a bit of a wobble as it spins which gives us the seasons with longer and shorter days but is also a cause in the Milky Way centre not always being visible at night with the “season ” being from mid March through to mid October . Composition and what you want in the image play a part in the final result. Some people love just the Milky Way in all its glory and others like to have foreground detail so some thought on this beforehand is good. 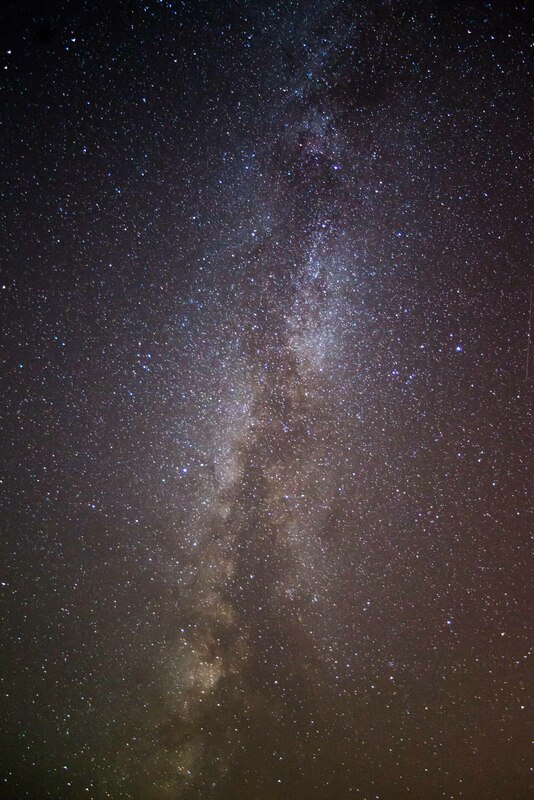 So before we have even started with the camera and taking the picture we have the hurdles of Location, Composition, Cloud cover, The Moon , Light Pollution and Time of year to deal with’ Unless you can forecast weather and have tracked the position and times of the Milky Way you will probably need some help. I use several different apps to solve these problems, for the cloud cover I have found “Clear Outside” very good. Its aimed at astronomers to show good times to go out and look at the sky. The second app I use is Plan-it Pro which has a lot of different information overlaid on a map so that you can see how dark it is, what time the sun rises and moon sets and the position of the Milky Way and if it’s even visible. These apps are available for both the iPhone and Android devices and are free. The beauty of this sort of planning you can do it all from the comfort of your arm chair. Other apps are available some are paid for, some only work with one device or the other and you can ask on any forum or group and there will be supporters and haters for all the different ones but these two are a start and all you need but if you wish to devote hours to trying different apps then have a play they are out there. The Milky Way will require using the “M” (Manual Mode) on the camera which will mean that you the photographer are in full control. To some that maybe a frightening idea but it’s only a case of dialling in a couple of settings and pressing the shutter. Below is a guide to the settings to use and why as there is no magic numbers or settings as every situation is different as is every camera setup. The only things to think about from this aspect is the shutter speed, aperture and ISO, which you may not have ever looked at before. 100 000 years to cross from one side to the other. It’s our galaxy, so being able to capture a large portion of it is the aim so a lens that is between 14-and 20 mm is ideal. A second factor on the lens choice is its low light capability as the stars do not produce a lot of light. Having a large aperture (Big opening or Small number) such as f2.8 or even f1.4 is the target to look for BUT this can be expensive. Great news many entry to mid range crop sensor DSLR cameras come with a “kit” lens which is somewhere around the 18-55 mm focal length are a great starting point and you don’t need to rush out to buy a new lens just to capture the Milky Way. As already mentioned there is only a small amount of light coming from the stars so being able to have a large aperture (Wide open or Small Number) to let more light and capture more detail is also always better. Moving up from the “kit lens” the 50mm f1.8, “The Nifty Fifty” (or 35mm on crop sensors) is great for letting light in but not that wide. The “Kit Lens” at 18mm has more sky but tend to have a smaller aperture which is less light and detail so unless you are serious about “astro” photography or already have a wide angle there is no need to spend money. I have used an old second hand lens from Ebay at 20mm (equivalent to 16mm on crop sensor) with f3.5 with very good results. So the lens choice is as wide as possible and as fast (or biggest aperture) as possible so something like 14mm f1.4 (or equivalent) being the best . As I have mentioned our planet is spinning and this gives the effect of stars moving across our sky. In real terms it does not matter who is moving if you just accept that there is movement and all is good. If you take a picture of stars with a long exposure you will start to see a curved line or arc appear on the photograph instead of the single dot that you had hoped for. When you leave the shutter open longer it gets bigger and that is the start of star trails which is another guide. To combat this problem were we want the shutter open as long as possible for the most amount of light but short enough to stop the trails beginning we have 500 rule that was developed during the early film days and still applies today as a guide or starting point. You may also hear the 600 rule mentioned occasionally but this is no different. The 500 rule is simple to apply. 500 divided by the length of the lens so if your lens is 50mm the calculation is 500/50 = 10 Seconds and for an 18mm the numbers as 500/18 = 27.7 Seconds which is realistically 30 Seconds. This is a magic number, not really it’s just a very good starting point and as you progress you will start to adapt this for your own times. So far we have seen that the longer shutter times let more light into the camera but at the risk of trails starting. We have seen how a large aperture (small f number) lets more light in. Being greedy and still want more. The last item we have in the arsenal is the ISO or in the old days of film it would have been the film speed. ISO is seen as making the sensor record more light but this come with a cost. The camera is turning up the “volume” or gain and starts to get distortion in the form of noise which makes a very poor quality image. Depending upon your camera the ISO numbers such as 3200 or 6400 would be best and maximum highest you would go to go. A few test shots of the night sky will show you where you can go but the lower the number the better quality will be attained but less stars and details, so another trade off. This simplification does not take into account of some variations to the numbers that are camera specific but they are more contained to high end systems. A timer( intervalometer) remote shutter release allows for more controlled exposure times. We have seen that exposures can be longer than those normally used because of the low light conditions but with most cameras having shutter speeds in the multiple number of seconds up to 30″ this may not be an issue for most situations but the only concern is that the increment between speeds are very coarse. The option of having a timer and using the “B” (Bulb) setting allows the remote timer to take care of the exposure time with smaller increments as well as allowing for exposure times longer than 30″. Much longer shutter times in the low light conditions may be required for foreground shots. Having a timer also doubles as a remote release which will reduce camera shake even further. An intervalometer can also allow for multiple photographs to be taken and then these can be processed into one photograph to enhance the image by reducing the noise. Trackers take care of the apparent movement of the stars in the night sky. The movement we see is in an arc, a tracker moves the camera very slowly at the same speed as the stars so that much greater shutter times can be achieved gaining a great deal more light and detail. Trackers are an investment into night photography and can deliver stunning results but they are not ideal for the beginner as initial learning curve is greater but it is something to work towards. From what you have seen here that is basically the start. Look for the Milky Way when there is no moon in a location that is dark take your camera, tripod, timer and start snapping. You are ready to try for your Milky Way pictures. For best results most photographers will shoot the image in RAW and process it with software to enhance it further but that is beyond the level of this simple guide and you need some images to play with before worrying about this aspect. So before you rush out with the camera I suggest you read through the simple guide again and check you planning details then check your kit before you set off. Batteries with no charge or no SD card can ruin any great plan. I would love to see your results from using this guide so email me with where you have posted them or if you have any questions drop me a line.